After reviewing the Manjaro based Netrunner distribution last week I decided to check out Manjaro again to see how much it has improved and how much value Netrunner added. What I found was truly amazing. I will start off by saying that Manjaro blew all my expectations out of the water. I expected Manjaro to be like Netrunner but with less applications but that couldn’t be further from the truth. Well actually it is a little bit true but not entirely true. Read on, you will see what I mean. According to the Manjaro website, Manjaro is a user-friendly GNU/Linux distribution based on the independently developed Arch Linux. Manjaro is built for newcomers as well as experienced Linux users. For newcomers there is a user friendly installer and the system is designed to work out of the box. There are a number of different versions available including an XFCE and KDE version both in 32-bit and 64-bit and a net edition which comes without a desktop environment and without applications. The version I am reviewing here is the KDE version. If you prefer to buy a pre-installed DVD or USB drive you can do so by clicking here. Everything you need to know about creating a DVD, USB drive and installing Manjaro can be found on this page. This page shows how to create a USB and DVD. 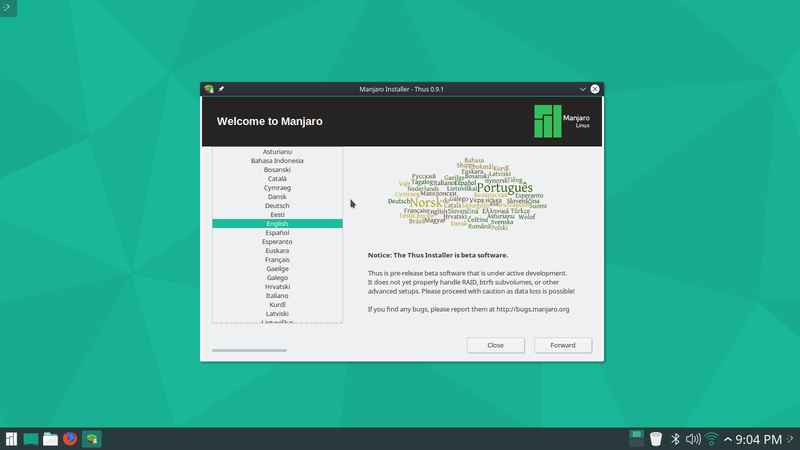 There are a number of installation guides available on the Manjaro website. This one is for beginners. The steps for installing Manjaro are fairly linear and straight forward. It is one of the easiest installers I have used although this machine has a standard BIOS and not a UEFI one. I would need to test this on a UEFI machine to get a full idea. (A task for another week). There is a UEFI installation guide which is worth checking out. Manjaro first boots to the display screen which asks you to choose your user and enter the password. The KDE desktop then loads with a welcome message in the middle. The welcome message has links to documentation, support and project sites. Manjaro’s documentation is very good and well worth reading. The rest of the KDE desktop is fairly standard with the panel at the bottom with icons to the left and to the right. 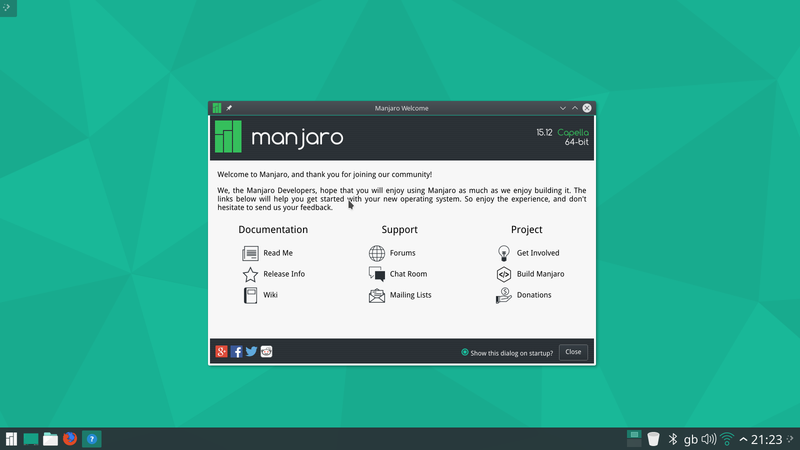 Clicking on the Manjaro logo in the bottom left brings up the menu. 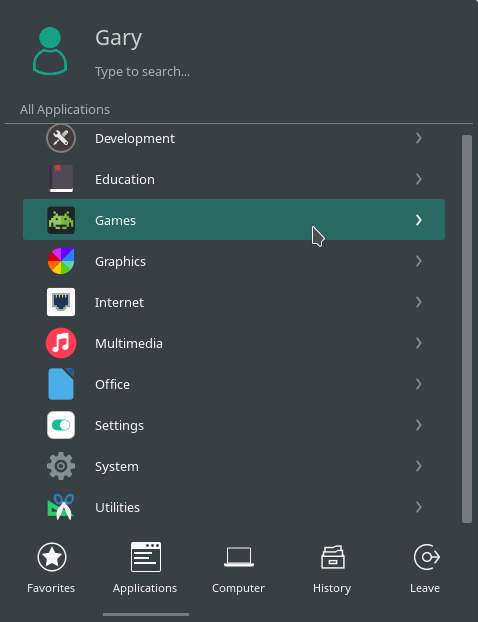 It is a decent menu system which defaults to your favourite applications but there are tabs for applications, computer, history and leave as well. The applications tab brings up a list of categories as shown in the image above. Clicking on the category shows the applications within the category. 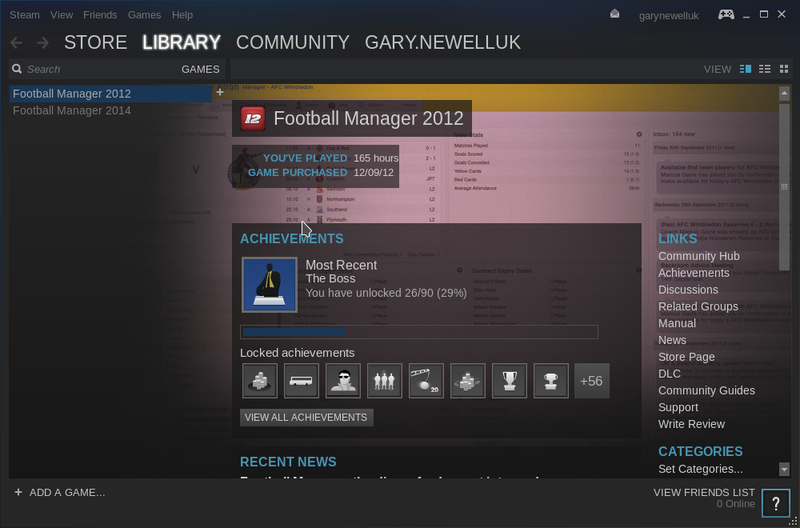 The other items on the left side of the panel are for show desktop, the Dolphin file manager and Firefox web browser. The bottom right corner has icons for choosing workspaces, wastebin, clipboard, bluetooth settings, devices, keyboard language, updates, audio settings, network settings, notifications and of course the clock. 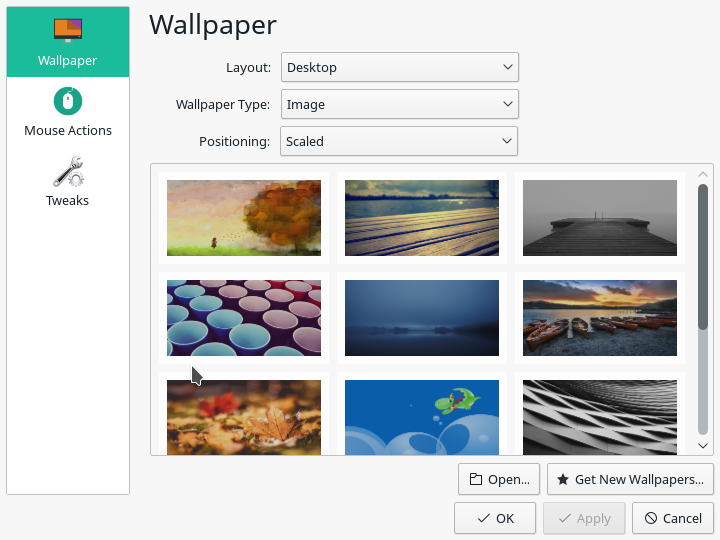 KDE has loads of customisable features including adding new activities, adding widgets to the desktop, changing the wallpaper and customising panels. Click here for an overview guide to customising KDE. At the very basic level you can right click on the desktop, choose desktop settings and pick from one of the many pre-installed desktop wallpapers. Manjaro comes with a fairly nice set but of course you can pick your own. Here is a sample of a pre-installed image. Connecting to the internet is straight forward. Click on the network icon in the system tray and choose the network you wish to connect to. You will be asked for the security key. As this is KDE the KDE wallet appears asking how you wish to secure things like saved passwords. Basically you give it an overall password which is used to protect other saved passwords. Ideally you would use a GPG key to protect this information but that is for another article. I noted in my last review that Flash is a dying product and Adobe has basically given up on Linux. 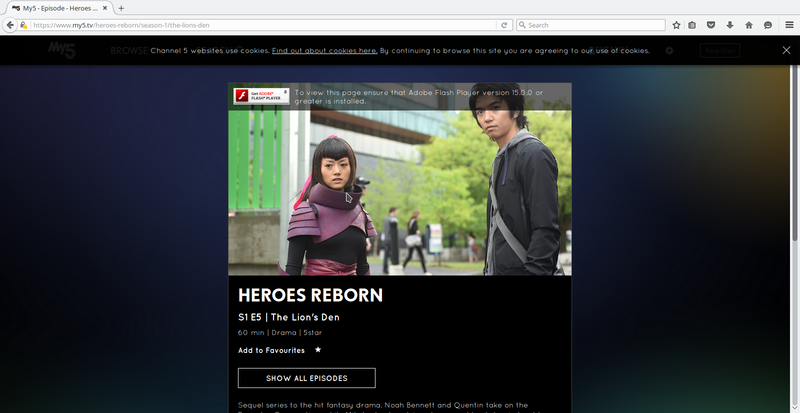 This means that Firefox is miles behind when it comes to version numbers and so if you try and watch catch up television you might get an error stating your version of Flash is too far behind. The best solution is to install Google Chrome which I will show you how to do later on. MP3 audio works straight away without having to install extra codecs. The audio package within Manjaro is Cantata which is basic but very nice. I reviewed the features of Cantata for about.com last week especially in regards to the online radio aspects. There are a few setup questions when you first start it. Basically you can use it as an MPD server allowing you to serve music to multiple devices or you can use it as a standalone player just for use on the computer you are using. The interface is simple but it works well enough and you can drag and drop tracks into the playlist. For the past couple of reviews on this computer I have had trouble with Steam because of the open source graphics drivers. I was fully expecting Manjaro to fail with the same issue especially as I spotted a menu option for clearing the cache which clearly states “OpenGL errors related to runtime library incompatibilities”. I clicked on the Steam link, waited for the download of the updates, waited for the extraction, waited for it to error out or hang and then bang…. nothing happened. It worked perfectly. You may remember at the start of this review that I said that Netrunner would be like Manjaro but with a few extra applications. This bit is largely true but what I found out is that Manjaro provides a really good mix of applications. There are enough to do what you want to do but not too many. I haven’t included absolutely every application but these are the main ones. In the Netrunner review I noted that there was an application called Discover which looked pretty but failed to do absolutely anything. Manjaro doesn’t include that application. The graphical package manager is the plain but simple to use Octopi. Simply search for a program using the search tool or navigate through the categories. Click the program you wish to install and away you go. There are limitations. If you want to install programs such as Chrome which aren’t in the default repositories you will need to use the command line. Chromium is available from within Octopi which is ok but it doesn’t solve the Flash issue if you need to watch videos on sites that demand an up to date player. 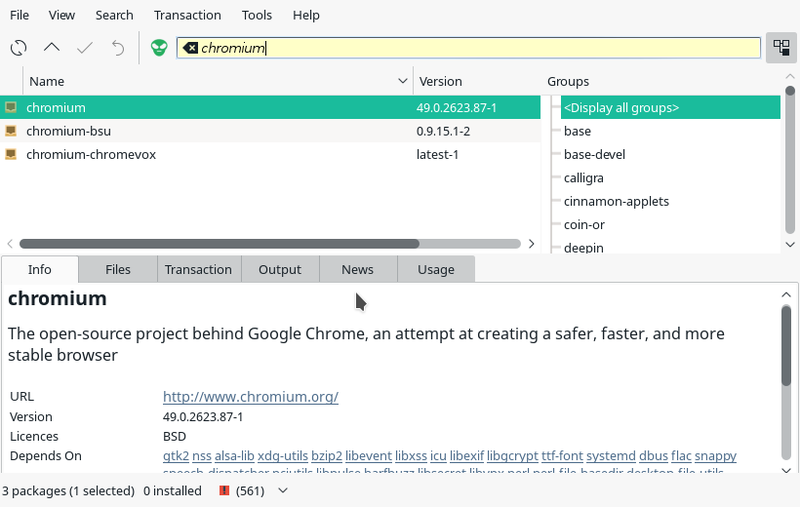 Installing Chrome is fairly straight forward but does require the command line. Press F12 to bring down the Yakuake terminal window from the top. You will be asked some questions along the way such as whether you want to continue building Chrome. Simply answer Y to the questions and when you are asked for your password enter it. Ok so the performance for Netrunner which used Manjaro as a base wasn’t bad but it was less than impressive. I would have thought that Manjaro would be much the same but no, the performance is great. The boot time and shutdown times are good and the overall performance of the desktop is brilliant. I can’t fault it. The whole experience feels very smooth. I haven’t had a single bad message pop up nor did I find any strange quirks. The keyboard layout is fine, Steam worked straight away and audio plays fine. I have put this machine through its paces by watching online television, playing music, watching Youtube videos, creating Youtube videos, updating my CV and I even helped my daughter create a presentation. I used to watch the Linux Help Guy videos on Youtube before he had to rename his channel for having a slightly racy background image in one of his video tutorials. He swore by Manjaro Linux and after using it I can totally understand why. I am no big fan of KDE but this is really very very usable, to the point I will be entrusting this to my main machine over the top of Linux Mint. Is it for everybody? You probably need to learn a little bit of command line, especially the inner workings of Yaourt and PacMan but other than that you should be golden. This is the best Linux distribution I have used in quite some time. I have used Manjaro and found it a very solid distro, but I have had a few problems with it. Printer support is not that good, and getting a scanner to work is quite difficult, without help from the forum. You have to use Yaourt (Aur) to install quite a lot of common programs, and it does not always work. For instance installing Spotify is a real pain. In the end I gave up on it, and have gone back to Kubuntu, which whilst it does not update so quickly is a far more solid and easy to work with distro. It seems that for all the knocks that they get Ubuntu based distros are the easiest and most solid to use. How one can change. 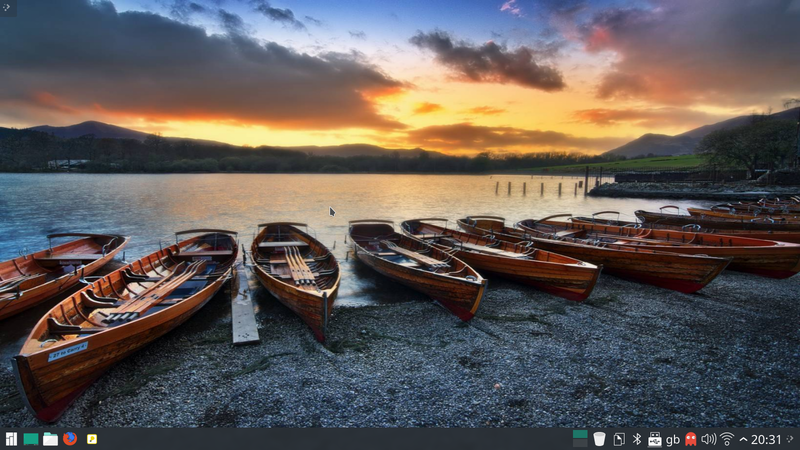 Started to get problems with Kubuntu ( I was using the development version) so have gone back to Manjaro. Now I know how to solve the few problems I had at first it seems easier. KDE? ARCH? DEBIAN? GNU? Each time I look, there's yet another unexplained term for me to ponder. For fsck's sake, will someone please explain them? Oh yes, and why when I run that fsck -f command in terminal does it tell me that I'm about to destroy my machine? I have lots of other questions but had better wait until I've cooled off a tad. Unusual Printer and Scanner drivers can usually be found on AUR. There are articles in the Arch Wiki on how to install, and googling around has always lead to installation as long as a Linux Driver existed for me. Finally, an unabashedly positive review of Manjaro! Seems like most reviews find some minor annoyance that I personally have never encountered. It really is a nearly flawless distro in my experience, using the KDE version for years now. In fact it has usurped Debian stable as my daily driver. Yes, it's been that stable, though admittedly my needs are simple. No need to reinstall every 6-9 months (or 2-3 years in Debian's case) either, a major selling point for rolling releases if you ask me. For those that don't want to scale the mountainous learning curve of installing Arch, Manjaro provides all the benefits with none of the pain. As Mint is to Debian, Manjaro is to Arch. It's even better though, because of pacman under the hood and more current apps. Great run through Gary, just wondering what spec of machine you installed on? I'm going to try the Manjaro-OpenRC edition when it's updated but was unsure about the KDE performance on my old SandyBridge i5 with Intel GPU. Can't speak for Gary, but I'm running 16.06 with KDE on an old Thinkpad T410 and having no issues at all. I5 520M with integrated graphics, and 8GB of RAM. I'd imagine it would run smoothly on nearly any i5. Excellent review and written in a language that is easy to read. Well done. I am an Archer that got burnt out on the community so looked around for a fork or derivative. 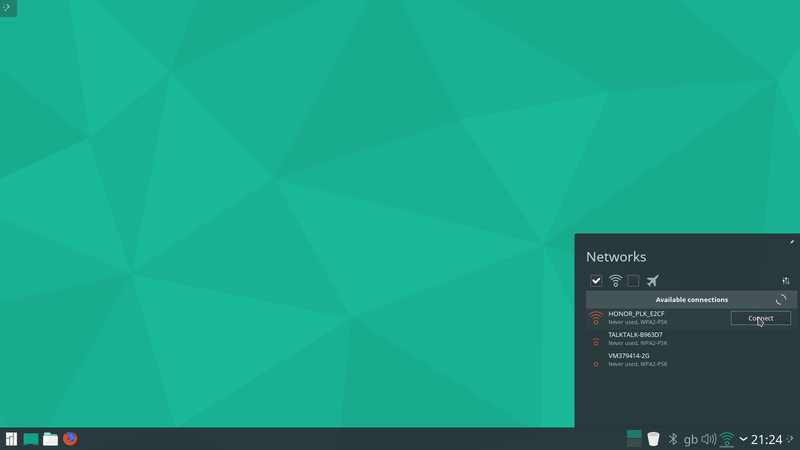 After playing with Netrunner, Blue Star, Antergos, Bridge Chara and KaOS, I decided on Manjaro because there were no issues with installation, the community is about as friendly a one that you will find, the team is BUSY, always patching, improving and more importantly responding to the users. Some of the things that might have been worth mentioning are some really handy features like the Manjaro Settings Manager that lets you search for hardware, change drivers, even add or remove kernels with a click of a button. Now all my machines have Arch and Manjaro running side by side. Arch is a bit faster and stable, but we're only talking about a hair's breadth a difference. Manjaro is one of the finest distros available. I tried the Xfce version of Manjaro and liked it too. I am using Manjaro KDE for a year now, and it is working fine in my laptop. My only complaint is that I couldn't set up my new Samsung wireless M2020W printer yet. I didn't get any help from the forum either. Overall, I like this distro. hi, too bad about the forum… I've always received help there… Are there Debian drivers available for your printer? If so there is an app called 'dpkg' which you can use to install Debian packages (but don't use it regularly instead of pacman). Printer drivers usually don't need updates every week. When installing packages available in the AUR like Google Chrome, you don't need to use a terminal (although I prefer the Terminal as i'm an Arch user, hehehe), you just need to click the alien head icon in Octopi. and you can search AUR packages inside octopi. I am an Arch user that has Manjaro on two of my computers. Why you ask? Because Manjaro not only has a very active team of developers that is constantly working on the distro giving me many of the benefits of Arch, but the community is infinitely less arrogant and far more friendly. Each passing month Manjaro improves. I have rarely experienced a problem and when I did, I went to the forum and felt like everyone there wanted to help – they made it fun and interesting. More importantly the developers themselves are active on the forum and have directly been involved. Great team of developers, very active and friendly community, fantastic support, some of the best documentation, they support a number of DEs and WMs, I get all the great things about Arch AND many of the things Manjaro offers that Arch doesn't: one click Kernel install/uninstall, one click graphics driver install/uninstall, mhwd, pacman.d/mirrorlist, Manjaro settings manager, etc. A question: Will Manjaro 16__ now play nice with several other linux os's installed to the same drive? I quit using earlier Manjaro versions because they would not allow a multi-boot setup without a hassle I did not want to deal with. Certainly, all you need is install the Manjaro. The Calamares will automatically chainload all the OS include windows. I've never had any success with Manjaro. Over the years, I've tried several official and community spins. I plain find it buggy as hell. I either can't get it to install without an issue. Or once it is installed, there's always something crucial that doesn't work. The latest version of 16.04.1 JWM installs fine and the system updates Can I get the post installation scripts to run? Not a chance. I quite honestly can't see the attraction of it. I can install SparkyLinux Xfce or any of their flavours and have a Debian Testing distro up and running with no, or only minor issues. The software is as up to date as Manjaro or Arch and there's a lot more of it. Manjaro always looks beautiful, I'll give it that. I get what the devs are trying to do. However, that's were it stops for me. I just don't like it. Those that know how to use Arch or Manjaro do. Every time i read these blogs there seems to be a wild difference of opinion. I think i know why. As i write this i am using a Thinkpad T400 with Manjaro xfce. I have tried all the usual distro's on this machine, but Manjaro is the only one i could get to use the discrete graphics card. All the others had to use integrated graphics, or i end up with a blank screen. Lifting graphics away from the cpu has made Manjaro more responsive and improved the graphics quality. Manjaro is perfect for my T400. I also have a later model Thinkpad T420s with ssd and integrated graphics. On this machine, again after testing 15-20 different distro's, i have settled on Linux Mint 18 xfce. With only integrated graphics to worry about, Mint is actually more responsive than Manjaro, A situation completely reversed on my other machine. I think this is one reason why none of us seem to agree on a single solution. Personal taste and needs not withstanding. For me this is one of the main benefits of Linux. Windows is a "one size fits all" Whereas with i believe over 300 distros and counting, you have the ability to tailor make a system to fit your machine, or in the case of someone like me who is relatively unskilled in linux, find a distro that fits your needs with only a few simple changes. I vote YES for Manjaro. It's been serving me well on at least three PCs(the number of PCs I have never seems to settle), and sometimes in VirtualBox on Windows. Thanks for your review. Im thinking about move my desktop to manjaro. This is a very fine distribution. The maintainers have constantly improved upon it at nearly every release. Its probably the closest thing to the MS-Windows "load and go" mentality I've ever seen, yet retrains easy and "generally works by default" access to highly specialized "pro" functionality like Infiniband RDMA, etc. either natively, or via the AUR. In all, simply a showcase for what a Linux desktop should have been all along. Hey Guys ! which is more strong and stable KDE or XFCE of Manjaro ? amazing ui, I love it. manjaro has a lot problems as we know. Im everyday user of manjaro xfce and kde on other PC. KDE has problem with OpenGL kompozitor, black screen around active windows. With Corsair K70 RGB keyboard ckb-daemon utility is CPU on 7-9%. And this is happen in idle state. Can kill it, but something take 7% of cpu power again. So another problem is uninstall KDE. This is not very easy, because pacman -Rs kde dont work, from console. XFCE has ckb-daemon on 11% but i can kill it. Gnome I have tryed fo a while. But the best desktop environment is XFCE nad Openbox(too small for nice graphic window).